In the past I’ve shared a recipe for authentic Sichuan style mapo tofu, which is rich and flavorful thanks to the added ground meat. But sometimes I just want a lighter dinner with plant-based ingredients. That’s why I developed this vegetarian mapo tofu recipe. 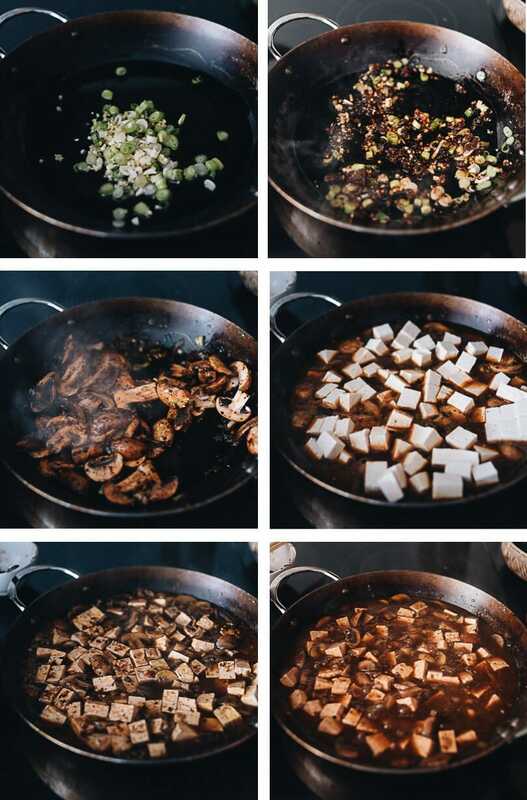 The cooking process is quite similar to that of the original mapo tofu, but it’s healthier and still yields a super delicious result. Doubanjiang (豆瓣酱), also called fermented spicy bean paste, is not your average hot sauce. It is a super rich, fermented, spicy paste made with dried fava beans, fresh chili peppers, salt, and wheat flour, then aged for one to eight years. Doubanjiang has a deep savory, spicy, and quite salty taste. 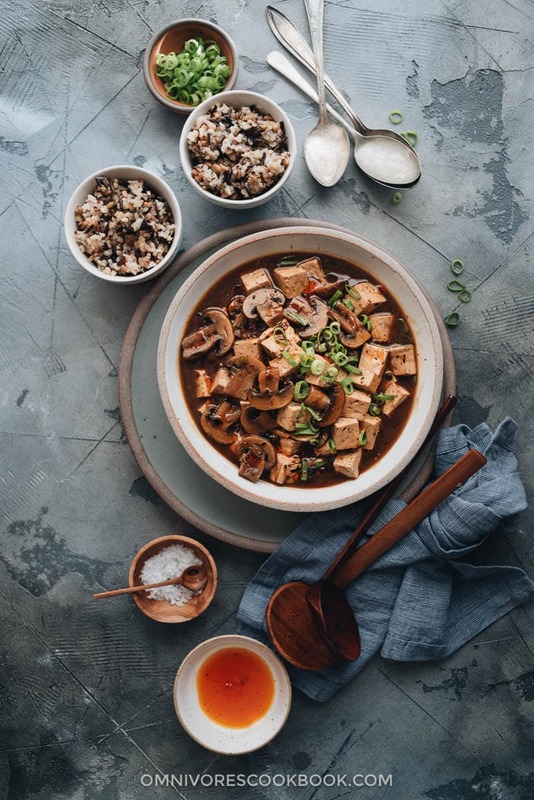 It is a key ingredient in classic Sichuan dishes such as Mapo Tofu, Sichuan Eggplant Stir Fry, Sichuan Beef in Hot Broth, and Sichuan Fish with Pickled Mustard Greens. You can find it in an Asian market, on Amazon, or at Mala Market. Fermented black beans, or Douchi (豆豉) in Chinese, are a very salty ingredient made from cooked black soybeans fermented in salty water. 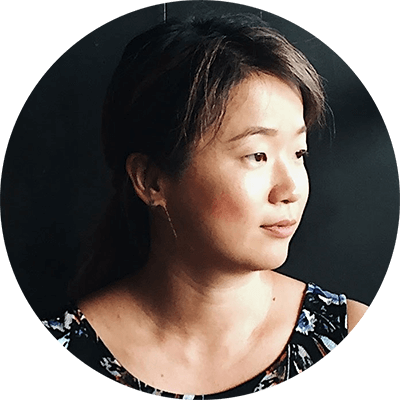 They have a deep umami flavor, like that of soy sauce, but with an even stronger, fermented fragrance. I always add some chopped douchi to my dishes to elevate the flavor, just like you might grate some parmesan on top of your pasta. It’s a key ingredient in Twiced Cooked Pork, Steamed Fish with Black Bean Sauce, and Stir Fried Chicken with Black Bean Sauce. You can find it in an Asian market, on Amazon, or at Mala Market. 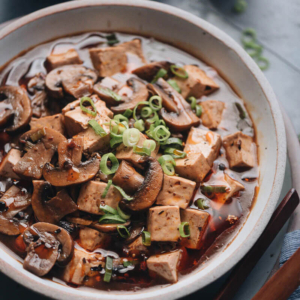 Once you have these two ingredients, you’re halfway to authentic-tasting vegetarian mapo tofu! Sichuan peppercorn (Hua Jiao, 花椒) is another key ingredient that you might not be familiar with. Fresh Sichuan peppercorns have a pungent aroma that lingers around the nose. Its taste is almost indescribable: numbing, tingling, and somewhat refreshing like mint. These peppercorns add a savory, smoky, and slightly citrusy flavor to a dish, and it’s that flavor that makes genuine Sichuan food. I consider it even more important than Sichuan chili peppers, truly distinguishing the dish and giving it a character unlike anything else. It’s a key ingredients in many classic Sichuan dishes such as Dan Dan Noodles, Mala Chicken, and Red Oil Wontons. I highly recommend you purchase Sichuan peppercorns from Mala Market. They carry the freshest Sichuan peppercorns in the US, sourced directly from Sichuan. It truly makes a world of difference. It might seem like a lot of trouble to source three special ingredients to make one dish. But here is the deal. Each ingredient is fermented for months, sometimes years, to achieve its ultimate umami taste. And you can spend a few dollars to get years of essence packed into your dish. Isn’t that amazing? Think about aged balsamic vinegar and parmesan cheese in Italian cooking. They’re totally worth the investment. 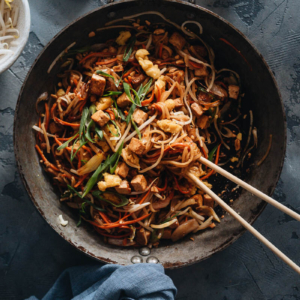 Plus, you can use these ingredients to create so many great Chinese dishes. Authentic mapo tofu uses quite a lot of oil to create that appetizing red color. For the homemade version, I tend to hold back on the oil to make my dinner healthier. I usually use 2 to 3 tablespoons of oil just so it’s just enough to properly cook the spices. If you are concerned about oil intake, you can reduce the oil to 1 tablespoon. In this case, you might need to splash some water if the spices start to stick to the pan. As I mentioned above, the doubanjiang, fermented black beans, and Sichuan peppercorns are the key to creating the best sauce. In addition, I added mushrooms to the dish. Not only do they add more nutrition to the meal, but the mushroom juice also lends its flavor to the sauce. It’s not shown in the pictures here, but sometimes I add a batch of spinach or baby bok choy at the end of the cooking, just to add some greens to my meal. It only takes a few seconds to cook through the veggies and it’s super tasty. It’s extra convenient if you’re cooking for one, to make a very nutritious one-pot meal. That’s it! 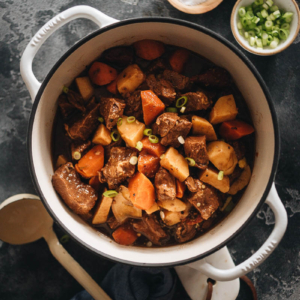 I hope you find the recipe easy to follow and the results rewarding! 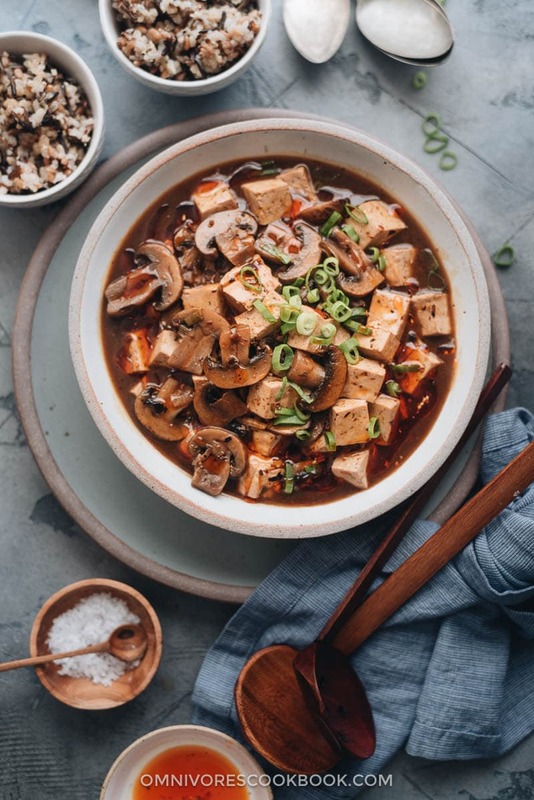 This vegetarian mapo tofu is so easy to make and irresistibly delicious.The tender tofu and mushrooms are simmered in a rich sauce that’s bursting with flavor. If you want the authentic Chinese restaurant experience, look no further! Add fermented black beans to a small bowl. Add water to cover, gently rub a few times with your fingers, and drain well. Use the back of a small spoon to smash the beans into smaller bits. Add the doubanjiang, chili flakes, and Sichuan peppercorns to the same bowl. Heat 2 tablespoons oil in a large skillet over medium heat until warm. Add green onion, ginger, and garlic. Stir a few times to release the fragrance. Add the spice mix from step 1. Cook and stir for 1 to 2 minutes, until the paste is cooked through and very fragrant. If the paste starts to stick to the pan, add a bit more oil or some vegetable broth and use your spatula to release any stuck bits. Add the mushrooms. Cook and stir for 2 minutes or so, until the mushrooms are evenly coated with the spices. Add a bit of vegetable broth if it start to stick. Add the vegetable stock, five spice powder, and sugar. Stir to mix well and bring to a simmer. 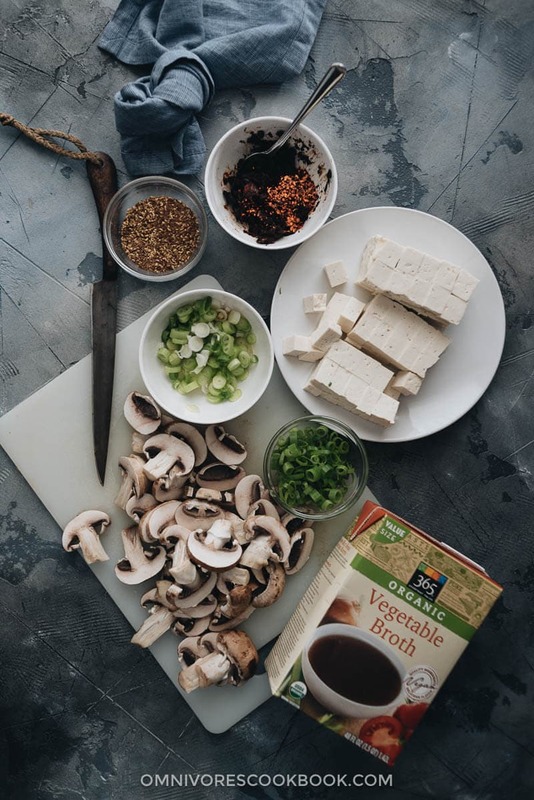 Spread the tofu in the broth in a single layer. Turn to low heat and simmer for 10 to 15 minutes or so. Whisk cornstarch with 3 tablespoons water until completely dissolved. Swirl half of the mixture into the tofu, stirring gently with a spatula. Add more until the sauce reaches the desired consistency. Taste a piece of tofu with some sauce. Add more sugar to balance the taste if it is too spicy for you. Transfer everything to a big plate. 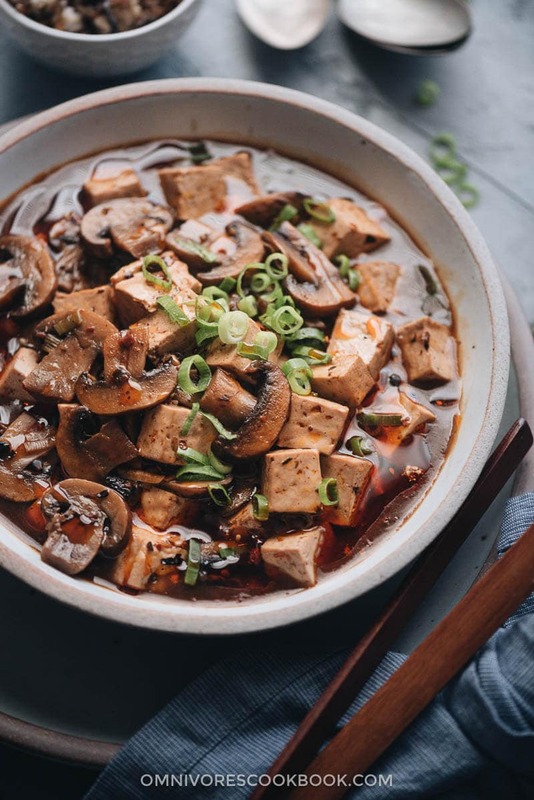 (Optional) If you want your dish to look like the authentic mapo tofu in Sichuan, swirl in a few tablespoons of homemade chili oil at the end of the cooking, to give the sauce a beautiful red color. 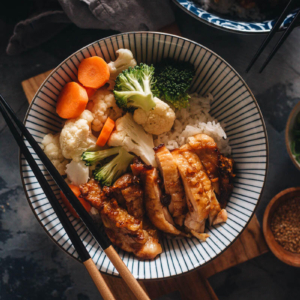 Serve over steamed rice as a main. That looks so good! We have an amazing Chinese restaurant near us and they are from Chengdu. They make a wonderful Mapo Tofu but they do use a metric ton of oil. A lighter version sounds great. I look forward to trying this. I am in love with all the great flavors here. I love both the spicy bean paste and fermented black beans. I keep them along with my shrimp paste, kimchi and all the other goodies in my fridge. That stuff just has so much flavor. Great tip on the szechuan peppercorns – I’ll have to check that place out. I got a large jug of anchovy sauce (kknari) from a Korean market but do not know what recipes it is used for. Do you?